Dahlias are easy to grow, but it's important not to ignore them when they're young. As with most plants, the new growth is tender. It's growing fast, but it's still vulnerable from the time it first emerges from the tuber and pushes up into the light until plants are a foot or two high. During this couple of months you'll need to be watchful. Once the plants grow a well-developed root system, they'll be stronger and more able to ward off bugs and dahlia diseases. Healthy, thriving dahlia plants are the most resistant to bad weather, to the ravages of slugs, snails and insects, and to disease. Your dahlias should be growing in a light, friable soil with adequate organic material like well-composted steer manure or mushroom compost. Unless you live in a very hot area, don't water your dahlias until after the new shoots emerge. Tubers in a damp environment are susceptible to rot and other disease; there should be sufficient moisture in the tuber itself to support the new shoot until it's up and growing. Then water cautiously if needed; don't let the plants dry out, but be careful to avoid overwatering. In most climates your dahlias won't need watering until they begin to produce blooms. the slugs, love tender foliage. Tender new growth is most attractive to pesky critters. Slugs and snails are likely the first attackers, and they can do irreparable damage quickly, devouring the first tender shoots as they emerge from the soil. The best remedy is prevention. Make sure there's no plant debris in your dahlia bed; if you mulch, use a fine-textured product like peatmoss to avoid creating moist havens where these voracious villains can hide from the sun. You may need to resort to slug bait; there are organic varieties available. Take care that baits or liquid products aren't used where pets and wild birds can access it or track through it. 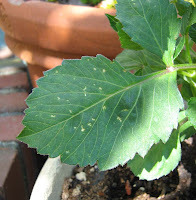 rid this dahlia of aphids effectively. Earwigs, thrips and aphids and other chewing and sucking insects can affect growth and development, so try to ensure that your dahlias are free of these pests. Earwigs are wizards at finding places to hide, including under rocks, in the hollow stems of bamboo stakes, and even the dahlia blooms themselves once they develop. Murder them on sight. Soapy water is sometimes sufficient to arrest infestations of aphids (greenfly, whitefly, blackfly) and other small insects like spider mites. Beetles of various sorts are major problems in some areas. Significant insect damage on the shoots of young plants can prevent full development and blooming. 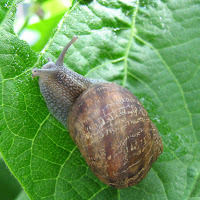 Many chewing and sucking insects also serve as vectors of viruses and other plant diseases. To minimize insect invasion, encourage ladybugs and laceflies as natural controls. Neem is effective against some worms and other larval-stage attackers. Plant disease is most serious it it occurs in young stock, some plant pathologists note. 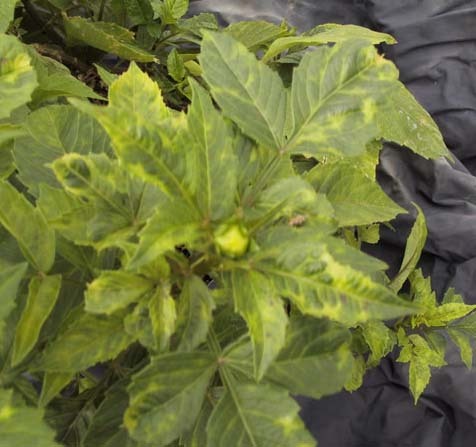 Dr. Hanu Pappu at Washington State University, who has conducted research for the American Dahlia Society, says viral infections have the most impact when plants are infected early. "Just like us humans," he says, "younger plants tend to be more susceptible to environmental factors and pathogens and they tend to develop some tolerance as they grow older." this dahlia indicate viral disease. Young plants afflicted with viral disease most commonly develop a "mosaic" pattern of light and dark areas on their leaves. Venal chlorosis (yellowing along the veins of leaves) or chlorotic spots (random yellowish spotting) can also be symptomatic of virus infections. Stunting and wilting are also indicators of viral diseases. Check with your local Cooperative Extension office if you're not sure. 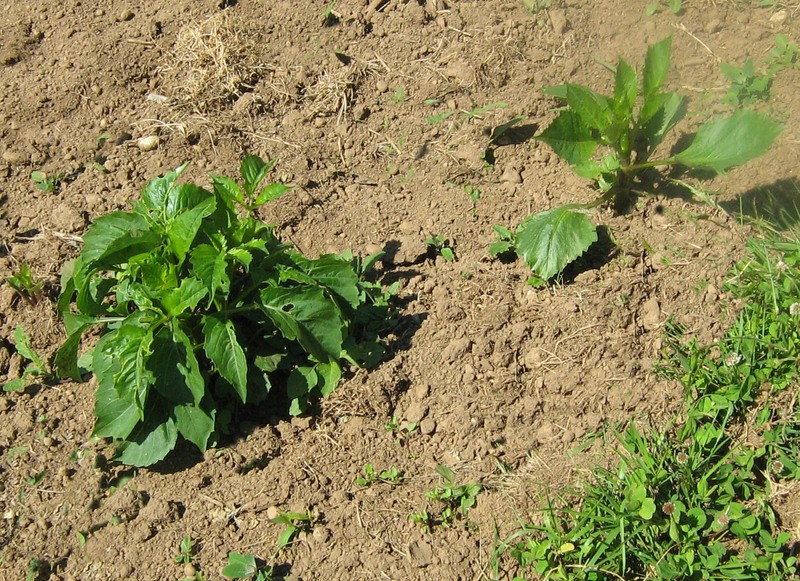 Plants affected by viruses should be destroyed before they spread the disease among the rest of the dahlias in a planted area. Root rot is another potential problem with young dahlias. Plants that fail to thrive and feel loose at the base of the plant may be losing roots to rot. These, too, should be destroyed, and the soil around them should not be used for planting other dahlias for at least a season or two. Chances are you can raise dahlias for years without encountering any of these problems. And taking good care of your dahlia plants while they're young is the best preventive measure you can take. Planning a Summer Wedding? Think Dahlias! Lynch Creek, Olympia Farmers Market are BUSY!